Dr. Yulita Chebotip Cheruiyot was appointed the second Deputy Governor of Nandi County by H.E the Governor, Hon. Stephen. K. Sang thus being at the verge of making history as the first woman DG in Nandi County and the North Rift region. The academic don who started her career as an Assistant Teacher in Ndurio Secondary School, 1993, maintained her career and profession well attracting admiration to many – putting her on top of the list becoming suitable appointee to deputize H.E the Governor Hon. Stephen K. Sang. The 47 year old mother of four is a resident of Katanin village, Ndalat Ward in Mosop Constituency and is married to Barnabas Cheruiyot. H.E the Governor expressed that his administration will bring all people on board with key interests in regional balance and empowering women and youth into leadership. Dr. Yulita Mitei studied Doctor of Philosophy in Chemistry at University of Botswana, Master of Science Degree in Chemistry at Kenyatta University, and Bachelor of Education (Sc.) Degree; 2nd Class Honours (Upper Division) at Kenyatta University. 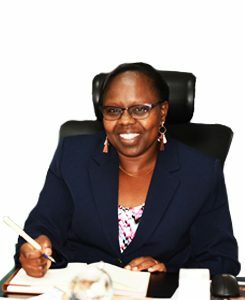 She has been, before joining politics, a Senior Lecturer in University of Eldoret teaching Analytical Chemistry to both undergraduate and postgraduate students, and supervising Postgraduate Thesis including Research Projects. She is well experienced in analytical soil fertility, micronutrients and pollutants, Lipid Profiling of selected seed oils from Africa, biodiesel and surfactant properties of selected seed oils from Kenya, environmental analysis of river and well waters, speciation studies of heavy metal pollutants in the environment, development of analytical methods for determination of trace elements, analysis of foods, medicine and other consumer products, essential elements, vitamins, and antioxidants, investigation of plants used as herbal medicines, and investigation of Iodine Deficiency Disorder Prevalence in the North Rift, Kenya. Dr. Yulita Mitei is an active advocate for the people living with disabilities, and is the Chairperson of the Disability Mainstreaming Committee at the University of Eldoret. She is empowering youth and women in Spiritual and Value systems since 1998, and has organized numerous seminars and workshops, of which many has successfully secured funding and donations. She is the founding chairperson of Ogyl Professionals Association. International Network of Women in Engineering and Science (INWES). Korge is a Nandi name of a Mother. Who is a Nandi Woman? She is a God fearing, Innovative, generous, wise, faithful, trustworthy, and a role model (mentorship) woman in her home and the society at large. The purpose for this training of trainers is to bring back the Nandi woman. Involvement in successful income generating activities should translate into greater control and empowerment of women in Kenya. Access to Microfinance- increasing women’s access to this will lead to social and political empowerment. For example Women Enterprise Fund by the Government of Kenya that comes in two operational channels; through financial institutions to develop and market special loan products to individual clients and the other part is channelled in the form of whole sale loans to women groups. Self Help Groups- If women pool their resources together in self help groups of their own they can radically change their lives and their communities as well as there is strength in numbers. By empowering women financially , we strengthen women’s voices and bargaining power within her home and the community. If you empower a woman you’ve empowered a family and a whole Nation. Equip ourselves with knowledge and understanding of a Nandi woman. Bring out our values and bring back our lost glory. Traditional ideas about the roles of girls and women restrict their contributions to Kenya. These ideas hold women back from contributing to important development goals; especially in the areas of economic growth, nutrition and food security. Women in Kenya are underrepresented in decision-making positions. They also have less access to education, land, and employment. Those living in rural areas spend long hours collecting water and firewood; interfering with school attendance and leaving them with little time to earn money or engage in other productive activities. The untapped potential of women and girls is gaining greater attention in Kenya. The country’s new Constitution, passed in 2010, provides a powerful framework for addressing gender equality. It marks a new beginning for women’s rights in Kenya; seeking to remedy the traditional exclusion of women and promote their full involvement in every aspect of growth and development. Korge Arise is empowering women to exercise their rights as guaranteed by the Constitution. We are bringing the perspectives of women and girls and their full participation to the frontlines. Narrowing gender gaps in education and learning. More than 70% of Kenyans, mostly women, derive some of their income agriculture. They grow the food, prepare it, store it, and sell it. In addition to bearing heavy labour burdens on the farm, women also balance household chores and child care responsibilities. Gender norms hold women back from reaching their maximum potential. Women have less access than men to credit, markets and training. Males typically control household income and assets, deciding how to allocate and spend the funds earned through their wives’ labour. Women, especially those living in rural areas, often depend on land to generate income. Yet, in Kenya, women only own one percent of agricultural land – a small amount considering their crucial contributions to agriculture, food security and nutrition. Women’s lack of ownership and control over land represents one of the widest gender disparities in Kenya.